In 2011, Marvel debuted a different Spider-Man in the "Ultimate Universe" comics. The Miles Morales version of Spider-Man dons a black cowl and foregoes the traditional red, white, and blue of Spider-Man's classic uniform and emblem for something a bit less flashy. His is essentially a parallel universe to the traditional Marvel comic book storyline. In addition to being from Brooklyn instead of Manhattan and having an Uncle Aaron rather than an Uncle Ben, there's one other major distinction that helps set this Spider-Man apart from the Peter Parker people might know and love: He's biracial. Miles Morales, an Afro-Latino American, taking up the web-slinging moniker is striking for many reasons. In this universe, Peter Parker is dead, and Miles has taken his place as Brooklyn's friendly neighborhood Spider-Man. This debut might have been shocking in 2011, but it now continues to challenge the way audiences see and interact with comic book characters. Now, racial representation sits front and center as a major concern when it comes to film and television. While Hispanic people made up 17 percent of the U.S. population in 2017, Hispanic TV representation only reached 8 percent, an increase from 3.1 percent in 2016. When it comes to comic book movies, major production studios have taken note with the way they depict traditionally Caucasian characters like Nick Fury and Aquaman, but is it enough? 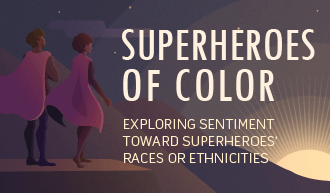 To learn more, we surveyed 990 superhero comic book and film fans about their sentiment toward superheroes' races or ethnicities, how well they believed superheroes reflected themselves, and what they preferred them to look like. 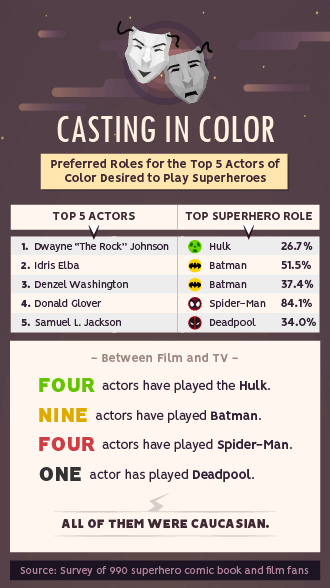 Want to know which actors of color fans would want to portray iconic roles like Batman or the Hulk? Read on to find out. The comic book industry has come a long way in the way it treats and depicts characters of color since introducing characters like Batman and Superman. Before "Avengers: Infinity War" exploded into theaters, shattering box office records, "Black Panther" clocked in as the fifth biggest opening weekend of all-time and was branded as "revolutionary" for the way it depicted and treated black superheroes. Black Panther, who was co-created in 1966 by Jack Kirby, was a direct response to the need for racial diversity in comic books. Perhaps because of everything Black Panther represents to the black community, or because race is so intrinsically woven into the fiber of his character, more than 60 percent of comic book fans said they didn't want T'Challa's race or ethnicity to change in the books or on the screen. Similarly, a majority of fans also opposed a change to Norse god Thor's racial identity. Only 40 percent of fans didn't want to see characters like Batman and Captain America changed – indicating 60 percent might not mind seeing a black version of Captain America or an Asian-American Batman grace the pages of their comics or the big screen. 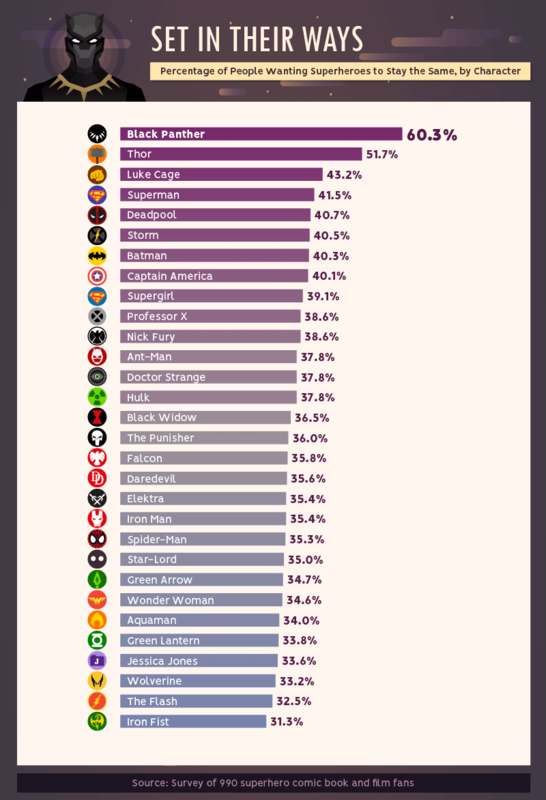 Most comic book fans were OK with seeing the races or ethnicities of some of their favorite superheroes changed. But how does that differ when characters go from the pages of a comic book to the big screen? In his silver screen debut, Aquaman (a traditionally Caucasian character) is played by Jason Momoa, a half-Hawaiian, half-German/Irish/Native American actor. Momoa hopes the diversity of Aquaman's character in "Justice League" helps inspire people who didn't feel like they "fit in" growing up. According to our survey, a majority of fans preferred the Native Hawaiian/Pacific Islander portrayal of Aquaman to his Caucasian characterization. Fans also voted for a black or African-American portrayal of Batman, despite him being portrayed by acclaimed actors like George Clooney, Christian Bale, and Michael Keaton in the past. Similarly, fans agreed Black Widow, Captain America, the Hulk, Iron Man, and Jessica Jones might all benefit from having their characters be portrayed as black or African-American. And while a majority of fans opted to keep Black Panther as-is, fans who wanted to see his race or ethnicity changed agreed a multiracial or biracial identity suited his character better. Mixed-race representation in mainstream media is often met with challenging responses and problematic imagery – even in comic book adaptations attempting to tackle this particular issue head-on. 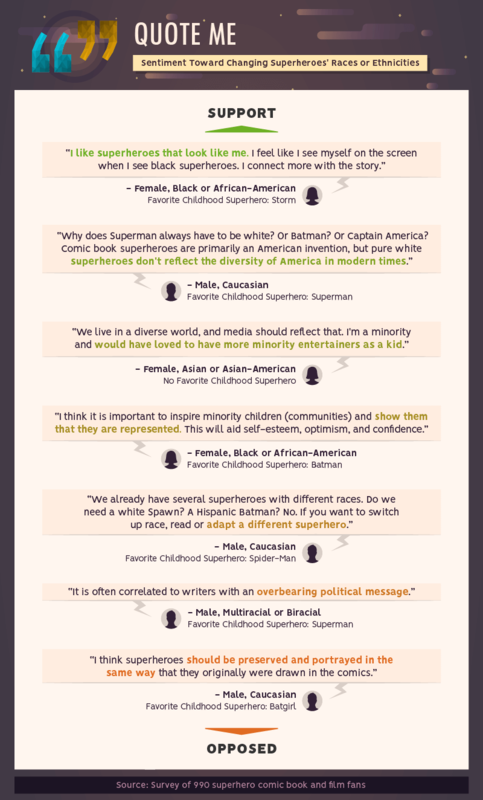 We requested the thoughts of comic book and film fans who both opposed and favored diversifying superheroes. Here's a taste of what they had to say. 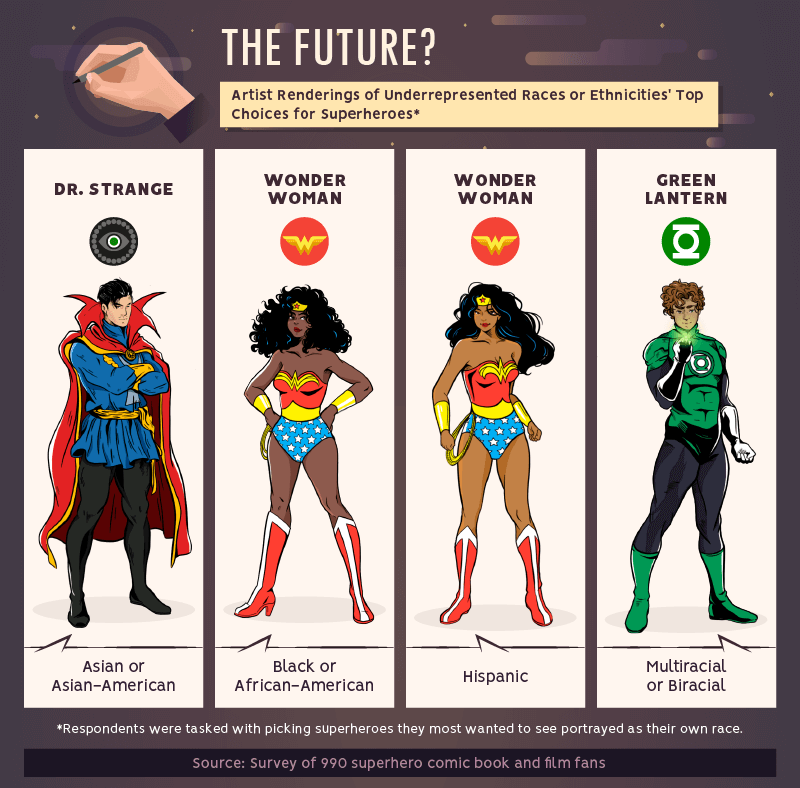 For some, including one multiracial or biracial man who said his favorite childhood superhero was Superman, diversity in comic books is "often correlated with writers with an overbearing political message." Another Caucasian man who picked Batgirl as his favorite childhood superhero said, "Superheroes should be preserved and portrayed in the same way that they originally were drawn in the comics." But not every fan shared these sentiments. One woman identifying as black said, "... it is important to inspire minority children (communities) and show them that they are represented," while a female fan identifying as Asian said, "We live in a diverse world, and media should reflect that. I'm a minority and would have loved to have more minority entertainers as a kid." 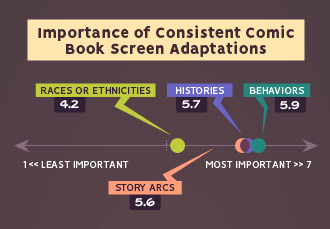 For fans, the race or ethnicity of a superhero as depicted in its original context isn't nearly as important for on-screen adaptations as story arcs, history, and behavior. 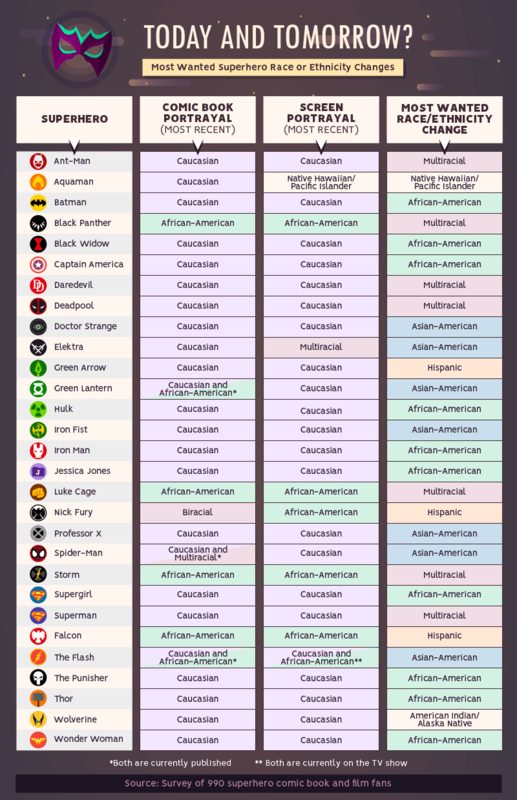 While racial background may play a role in some characters' histories and behaviors (like Black Panther or Storm), it may be less relevant for others. According to Kevin Feige, president of Marvel Studios, the future of the Marvel Cinematic Universe is "diversity and representation." With the special care that was taken to create "Black Panther," it isn't hard to see this idea already in action. Still, some critics believe these efforts are more of an attempt at political correctness and less about the importance and power of diversity. Comic book fans had a different take, though. Nearly 93 percent of women and 84 percent of men believed superheroes needed to be more diverse than their current offerings. 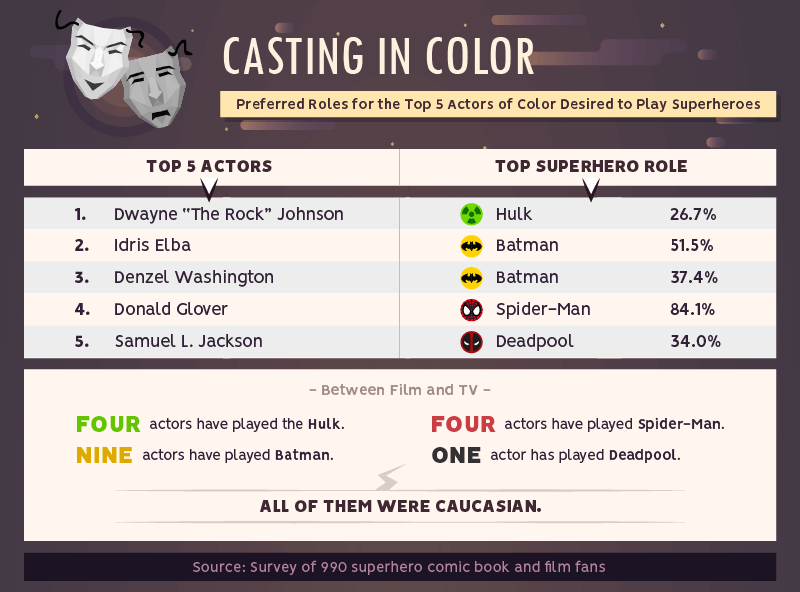 And while Caucasian respondents were the only ones to suggest they felt well-represented by today's batch of superheroes, black, multiracial or biracial fans, and Asian respondents thought they were almost not represented at all. 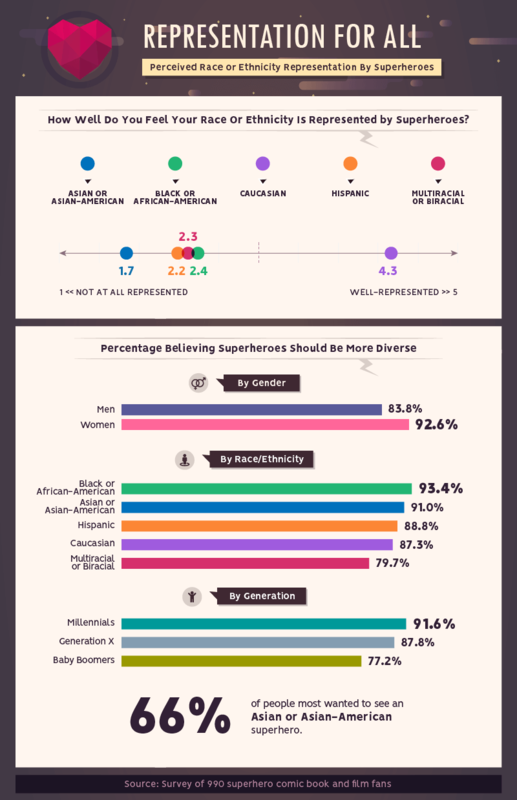 Nearly 92 percent of millennials believed superheroes should be more diverse, followed by almost 88 percent of Gen Xers and roughly 77 percent of baby boomers. We next asked respondents about which characters they'd most want to see reflected in their own race. The British-born Benedict Cumberbatch may play the newly introduced Doctor Strange, but Asian comic book fans most wanted the Time Stone-wielding Master of the Mystic Arts revamped as their own race or ethnicity. 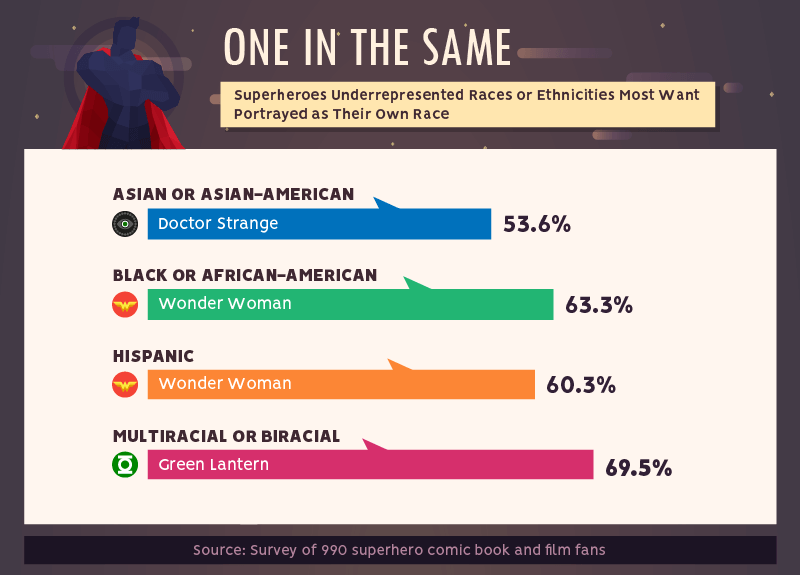 Similar to Doctor Strange, black and Hispanic fans most wanted to see Wonder Woman reimagined in their race or ethnicity. Gal Gadot, an Israeli-born actress, has made a strong stance on and off the screen to help establish Wonder Woman as a feminist icon. Representation of women in comic books and their subsequent screen adaptations has had its ups and downs, but critics largely agree "Wonder Woman" is a step in the right direction toward positively portraying women. Fans might also like to see Wonder Woman's creative directors take her inclusiveness a step further by depicting her as a strong woman of color. Doesn't an African-American Bruce Wayne sound particularly appealing? Or even an Asian-American Doctor Strange? We think so too. Here's a quick look at what some superheroes might look like if reimagined to reflect the races or ethnicities of comic book and film fans. Pretty cool, huh? Diana, princess of the Amazons, is technically from the fictional land of Themyscira, but her race has been depicted as Caucasian in the comic books since she was introduced in 1941. Here, our artists have reimagined what Wonder Woman might look like as both an African-American and Hispanic warrior princess. The Green Lantern has gone through multiple character changes and depictions over the years, including as the black John Stewart in the comic books and the animated "Justice League" TV series. Here an example of what the Green Lantern might look like if he'd been characterized as a biracial superhero instead. Whether you grew up reading comics, playing with action figures, or watching Saturday morning cartoons, superheroes and the stories they tell are deeply connected to fans' nostalgia. The connection between these characters and fans' experiences is clear even if it exists within a racial divide. Superman may be characterized as a white man, but his story is more complicated. As an alien, outsider, and immigrant, the depth of Clark Kent's lore is more than skin-deep. 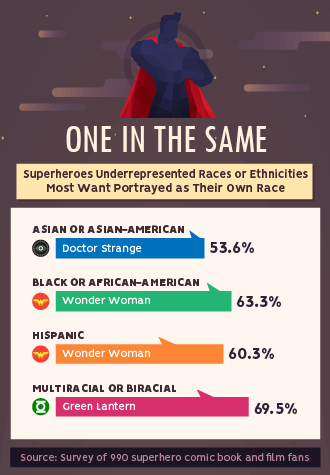 Nearly 1 in 3 Hispanic respondents and over 1 in 4 multiracial or biracial people listed Superman, the hero from Krypton, as their favorite character growing up. Many comic book fans also identified Batman as their favorite childhood superhero. While that represents 29 percent of Caucasian people, it also includes 1 in 4 black participants and over 1 in 5 fans identifying as Asian. 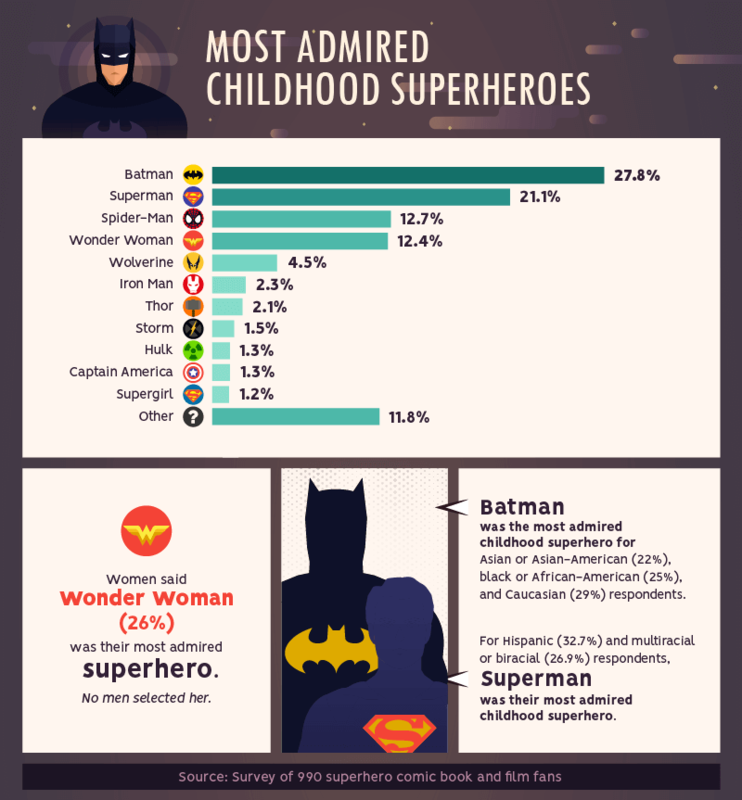 ‍While 26 percent of women said Wonder Woman was their most admired childhood superhero, no men selected her as such. When Marvel cast Samuel L. Jackson as Colonel Nick Fury, they didn't just update his character appearance for the films – they ultimately retconned his personality. One writer decided to "recast" Nick Fury, once portrayed as a grizzled Caucasian male, in the pages of the "Ultimate Universe" comics (the same series where Spider-Man is now portrayed as the half-black, half-Puerto Rican Miles Morales). Fury was drawn to look like Samuel L. Jackson in 2001, which ultimately led to Jackson's casting in the Marvel Cinematic Universe nearly a decade later. According to our survey, over 84 percent of fans would like to see Donald Glover play the web-slinging Spider-Man. The notion isn't entirely unfounded, and Glover even made a bid for the role (assuming "Spider-Man: Homecoming" would recast Peter Parker as Miles Morales). He didn't land the role, but he still showed up on screen. Glover appeared for a brief second as Aaron Davis, Morales' uncle (and career criminal known as the Prowler), and his few seconds in the film could be a sign for bigger things to come. Other notable picks? More than half of fans voted to see Idris Elba cast as Batman (in addition to James Bond, of course), while another 1 in 3 wanted to see Samuel L. Jackson play Deadpool. Denzel Washington was pegged to play Bruce Wayne by over 37 percent of fans, while Dwayne Johnson earned over 26 percent of the vote to play the Hulk. It may be quite some time until we see true diversity, but every comic book, movie, animated TV show, and fan petition brings us one step closer to a truly inclusive fantasy universe. As we found, a majority of comic book fans are in favor of continuing to diversify the way superheroes look for audiences to come. At GeekWrapped, we're here to help you celebrate your inner nerd however you see fit. Whether you're looking for the perfect gift or just something for yourself, GeekWrapped has a handpicked collection of fun and unique products to match every taste. There's no limit to the way you can show off your love for these characters, so don't settle for mediocre products. Shop our curated collection of science and geek gifts today at GeekWrapped.com. We collected responses from 990 superhero comic book and film fans via a survey. Fifty-two percent of participants were men, and 48 percent were women. Eleven percent of participants were Asian or Asian-American, 10 percent were black or African-American, 7 percent were Hispanic, 4 percent were multiracial or biracial, and 67 percent were Caucasian. Eight percent of participants were baby boomers, 29 percent were Gen Xers, and 63 percent were millennials. Participants ranged in age from 18 to 82, with a mean of 35.4 and a standard deviation of 10.7. Demographics with a sample size smaller than 20 were excluded from segmentation. We weighted the data to the 2016 U.S. census for age, gender, and race. Have your own take on what the next generation of Batman and Superman should look like? Feel free to share the results of our study with your readers for any noncommercial use. Be a hero and make sure you include a link back to this page so that our contributors get credit for their work too.